The cast of "Arias to Die For"
Dell'Arte Opera Ensemble is celebrating its tenth anniversary season with two operas opening this week (more on that later) and also by honoring the talents of some promising young singers who were cast in smaller roles or as covers in the upcoming productions of Mozart's La clemenza di Tito and Monteverdi's L'incoronazione di Poppea. 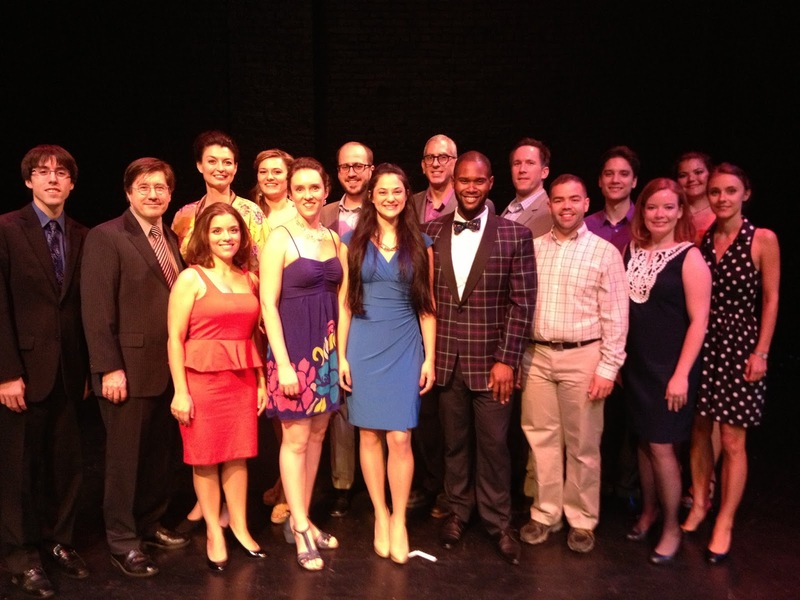 What an abundance of talent we heard at last night's "Arias to Die For" at the intimate 13th St. Theatre. The program was well chosen to highlight each performer and comprised some favorite well-known arias as well as some that are not often heard. Many of the choices were highly ambitious. Dell'Arte Opera Ensemble is well known for choosing promising young singers and nurturing their talent with seminars, coaching and master classes--then giving them the opportunity to perform a new role for a grateful public which appreciates the modest ticket prices and enjoys the opportunity of discovering a new voice. Take for example the lovely rich mezzo of Milica Nikcevic who sang "Mura felici" from Rossini's La Donna del Lago and "Acerba voluttà" from Cilea's Adriana Lecouvreur. This is a sizable voice that, with appropriate training, could offer the same thrills as that of Stephanie Blythe or Marilyn Horne. As another example, take Edwin Vega whose sweet Italianate tenor was put to good use in the Italian Singer's aria from Strauss' Der Rosenkavalier. We were delighted to be introduced to their special talents and hope to hear more of them. The evening featured a number of light-voiced sopranos whose focused tone made them a pleasure to hear. We particularly enjoyed Samarie Alicea-Feulien's "Caro Nome" from Verdi's Rigoletto; her voice and personal charm made that aria a perfect choice. Anna Farysej's bright soprano was attractive in Mozart's "Padre, germani" from Idomeneo, as was Kathleen Jasinskas'in "Non si da follia maggiore" from Rossini's Il Turca in Italia. Embellishments were well-negotiated and connection with the audience was evident. Mezzo Heather Gerban had a lovely vibrato in "Che farò senza Euridice" from Gluck's Orpheo ed Euridice while mezzo Allison Waggener tackled "Smanie implacabili" from Mozart's Cosi fan Tutte. Mezzo Heather Antonissen was convincing in "Se Romeo, t'uccise un figlio" from Bellini's I Capuleti ed i Montecchi. Soprano Kristina Malinauskaite sang "Regnava nel silenzio" from Donizetti's Lucia di Lammermoor and a Tosti song "Sogno". The male singers were equally interesting. Tenor Charles Williamson sang "Deh miei bollenti spiriti" from Verdi's La Traviata with some lovely phrasing and a Donaudy song "Amorosi miei giorni". Tenor Caleb Stokes focused on Puccini with "Ch'ella mi creda" from La Fanciulla del West as well as the despairing "Hai ben ragione" from Il Tabarro. Baritone Nicholas Connolly sang Silvio's aria from Leoncavallo's Pagliacci. Bass-baritone Sanford Schimel certainly had the acting chops for "Il lacerato spirito" from Verdi's Simon Boccanegra; he ended on an impressive low note. Tenor Nathan Létourneau got a nice hand for his performance of "Una furtiva lagrima" from Donizetti's L'Elisir d'Amore. Maestri Christopher Fecteau and John Spencer IV did some fine accompanying on the piano. May we add that each singer introduced his/her aria with a concise summary of the aria and its place in the opera. This is welcome news for opera newbies which Dell'Arte does so well at bringing into the opera fold, and for those whose Italian is sub-par. The entire evening had the flavor of a salon for friends, fans and family. 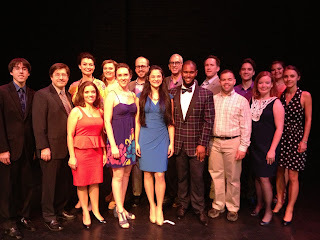 If your interest has been titillated, be sure to take a look at www.dellarteopera.org for performance dates. You won't be disappointed!